Hi again, my dear readers! Our papers have been already simplified in the earlier years because I did the KonMari method at 2015-2016 for the first time, as we lived in Finland. But surprisingly enough, I was still able to discard a huge pile this time. Some extra challenge to the paper storage brings the fact that we have dealt with taxes in three countries now: Germany, Finland and the States. I know that for tax purposes in Finland one doesn't need to provide any papers normally, unless you want to report extra costs or something. In Germany our tax counselor provided a clear list on the paperwork that we needed to provide. I don't have much experience on the paperwork needed in the US but I used the experience from the other countries to decide about the local paperwork. My husband is in the process of doing our taxes for last year. I need to discuss with him and make a list of the papers that he has needed or will need for proof for the process. I'm sorry the next picture is not pretty. I used the files I had from before and was only worried about the organization, not aesthetics of the outcome. The papers are stored in a cupboard in our dining area. There they are easy to access but out of sight. I don't know if that is where they will stay yet, we'll see in the end of my tidying festival! The uppermost shelf holds our 'Must be kept indefinitely' paperwork. In the lowermost shelf are my husbands report cards from school and references from previous employers, which also fall into this category. In the middle we have all of our tax papers in one file, categorized by year. I keep everything for seven years and then discard the whole bunch. That would be 'Needed for a limited period of time'. I found that seven years from somewhere as I was investigating the issue previously here and here and here (sorry, all in Finnish...). 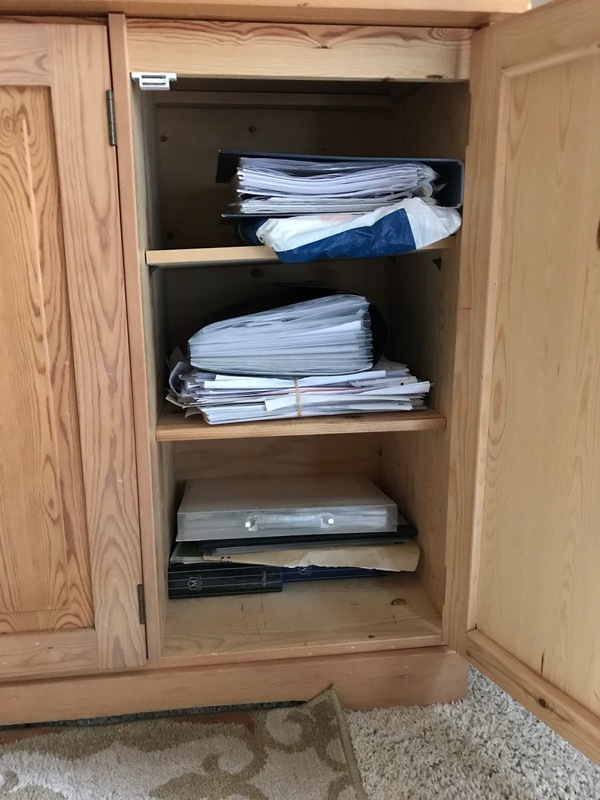 We don't have a paper shredder, so underneath that file in the middle shelf we have the papers that need to be destroyed. In addition to the old tax papers that I now removed from the file, it also has some other official papers like contracts that have come and gone. I haven't decided yet how to get rid of them. But I'm going to keep them anyway until our taxes for 2017 are clear so I have time to figure out. In the lowermost shelf underneath I have two small file of German account statements. I will let go of them along with the tax papers when the seven years have passed. The transparent file on top of that pile is my 'joy file' - papers that I store just for the joy they bring. I will sort them through in the end when I do the sentimental items. In addition to this I have one more place for papers. That is on our countertop in the kitchen. There I have all the papers that are 'Currently in use' or that I haven't had a chance to have a closer look at. The goal is to have it empty but I don't think it ever will, in the course of everyday life. I try to address it at least once a week. If I have paperwork to be done that has a schedule, I have a reminder about it in my calendar. I don't like to hang any papers in the fridge door or somewhere to be seen. 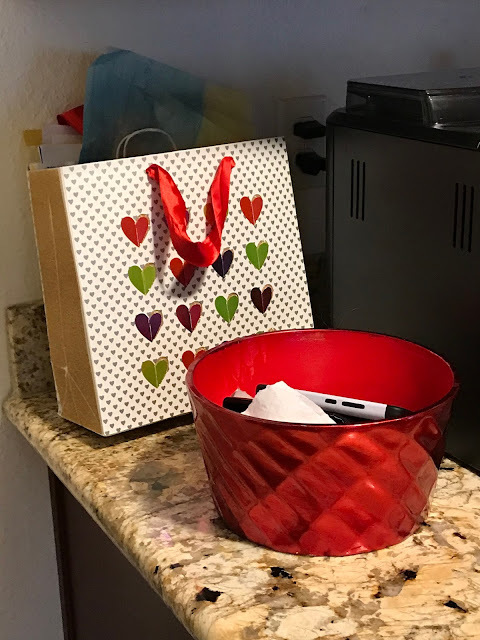 Anyways, all of the random papers and 3-dimensional knick knack end up in this one spot in our kitchen from where I try to process it onwards at least once a week. I discard most of the papers that enter the house on a daily basis. Yesterday's newspaper, kids' accomplished school work that doesn't spark joy to them, advertisements, receits, church bulletins... All this goes to the recycle ASAP its been checked for its information. This way I feel that I'm on top of our paper flow. I know exactly where to put a random piece of paper that I see floating around. If a piece of paper belongs to some of my family members, I ask them before discarding it. But I have already learned what kind of papers I can discard without asking. Like kids' math papers - they never want to keep them unless it has a nice picture they have colored themselves. I still have to work on the kids' paperwork. They have their own joyfiles but I have to check if any important papers like school reports have ended up in there by accident. Usually they just store their drawings or tests that have special meaning to them. To finalize, I'd say I have a better idea now about what kind of papers I need to keep and how I store them. I'm sure it could be even more simple but this is as much as I am able to do at this point of my life. The next step now will be finding the proper place for our papers and maybe some joyous files to keep them in. I know I should store them vertical, not horizontal. But as it is in KonMari method - finding places for things happens after discarding all the no-joy items from the house, not after each category during the discarding process. You can add your own subcategories, if you have a lot of the same kind. In my case for example, I will do my knitting and crocheting stuff separately from my sewing things but someone else might have them as a single category for handicrafts. So, I'll be back for my thoughts and process on CDs and DVDs!